I believe in low key, easy entertainment: a few simple dishes, a few contributions from my guests, fresh flowers, casual plates and glasses, and a lot of catching up and chatter. A few weeks ago when I had two friends over for brunch at my condo, I decided to make an antipasto platter as an appetizer, dark chocolate and red currant muffins as dessert and something with eggs as a main course. 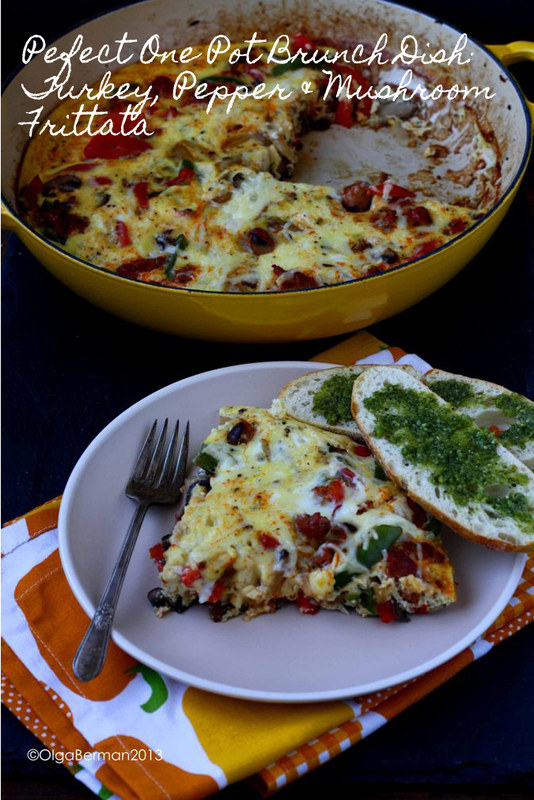 At first I thought about making breakfast casserole with eggs, bread, sausage and vegetables, but then settled on a frittata served with toast. Below is my creation. 2. Heat a bit of olive oil in an oven-safe skillet (I used Le Creuset I found on sale at Marshalls). 3. Add the Italian sausages and cook until they are brown, breaking them into bite-size pieces. Remove from the pan. 4. If necessary, add a bit more oil to the pan. 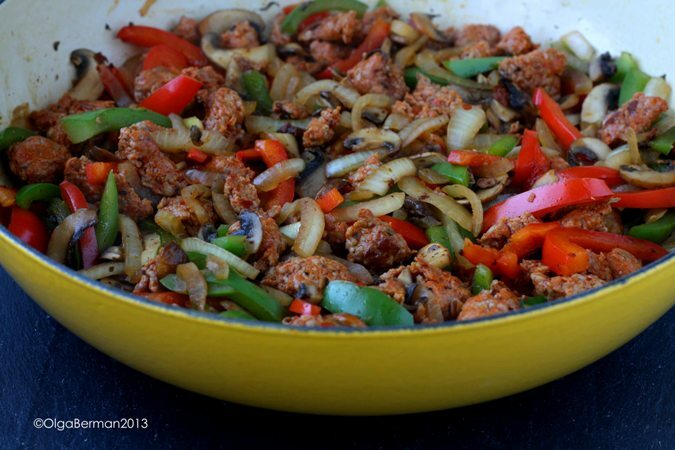 Add peppers, mushrooms and onions and season with salt and pepper. Cook the vegetables until they are tender, but not completely soft. 5. Add the browned sausage back into the pan. 6. 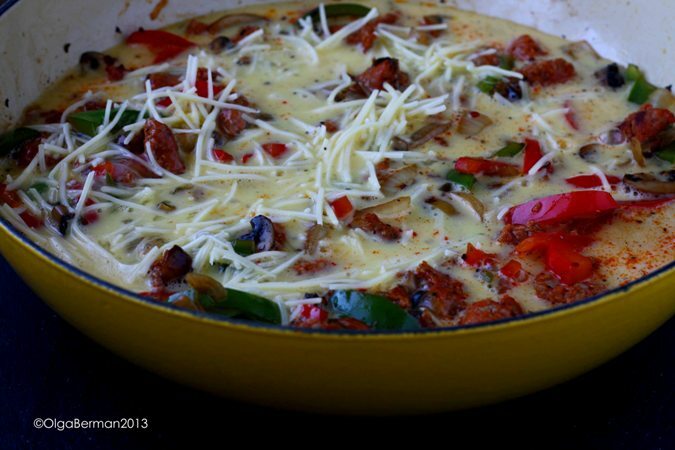 In a bowl, whisk together the eggs, milk and cheese. Pour over the sausage/vegetable mixture. 7. Put the pan into the oven and bake for 20 minutes uncovered. 8. 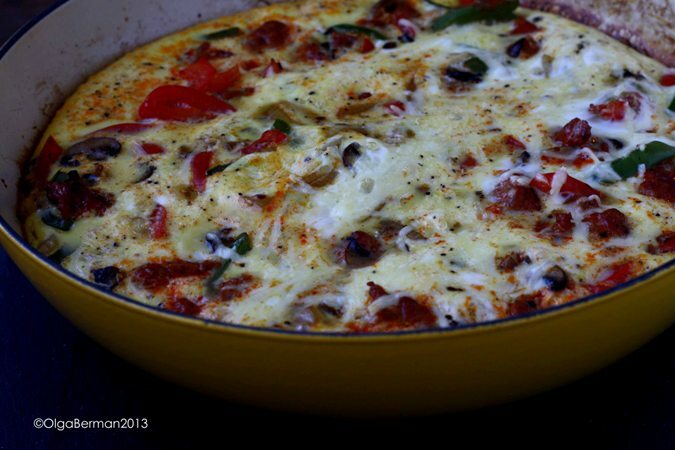 Let the frittata sit for 5 minutes out of the oven before cutting into it. Serve with toast and lemon basil pesto. 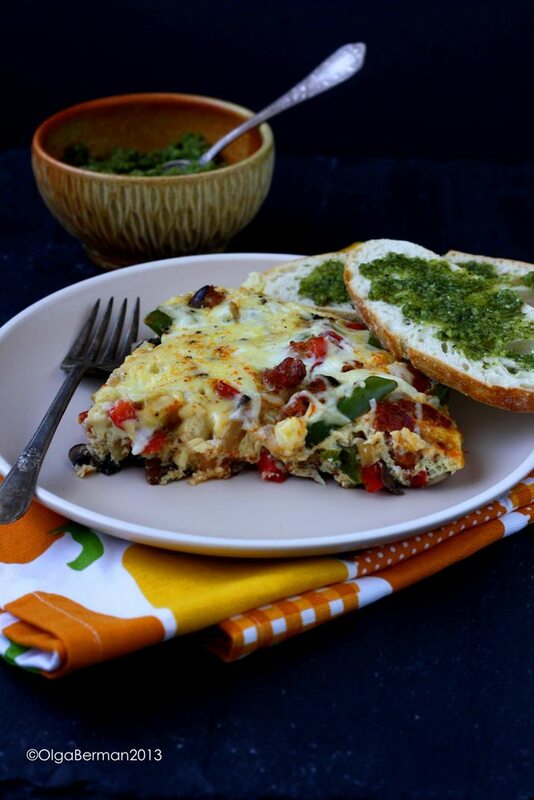 If you have some of this frittata left over, it's great at room temperature for breakfast the next day or as lunch with a big salad. 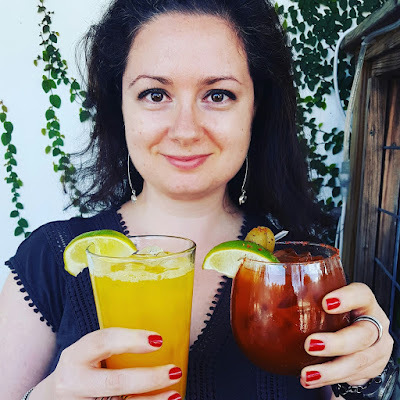 What do YOU like to cook for brunch when you friends over? PS I will share recipes for the dark chocolate and red currant muffins AND for the lemon basil pesto in the next few weeks. I really am coming over for brunch... one of these days. :) It will happen.